These hoisin chicken bowls have a savory-sweet sauce you’ll want to put on everything and come together in just a matter of minutes when you meal prep them! Toss brussels sprouts with 1/2 tablespoon olive oil, ¼ teaspoon sea salt, and pepper. Spread out on a rimmed baking sheet and bake 30 minutes. While brussels sprouts are in the oven, add coconut aminos to a small saucepan over medium heat. Simmer for 10-15 minutes, until it thickens to coat the back of a spoon. Scrape the sauce into a separate bowl and add the rice wine vinegar, sesame oil, fish sauce, ginger powder, and almond butter. Whisk until smooth. Mix the chicken with the hoisin sauce. 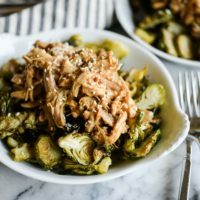 To serve, spoon hoisin chicken on top of brussels sprouts and garnish with sliced green onions and sesame seeds. 2 cups pre-made roasted brussels sprouts. Add all the coconut aminos to a large skillet over medium heat. Simmer for 10 to 15 minutes, or until it thickens to coat the back of a spoon. Scrape the sauce into a separate bowl and add the vinegar, sesame oil, fish sauce, ginger powder, and almond butter. Whisk until smooth. Warm the chicken either by microwaving 30 seconds to 1 minute with a damp paper towel placed over it, or in a skillet over medium heat with a teaspoon of oil for 3-4 minutes until warmed through. Mix chicken with the hoisin sauce. Reheat the Brussels sprouts either by microwaving for one minute or in a skillet over medium heat with one teaspoon of oil for 3-4 minutes until warmed through. Plate Brussels sprouts and spoon hoisin chicken on top. Garnish with sliced green onions and sesame seeds. Serve!